In a surprise victory, Ibrahim Mohamed Solih, center, ousted the president of the Maldives. On Monday, he celebrated with supporters in the capital, Malé. Supporters rushed into the streets of Malé, the capital, on Sunday night, waving yellow flags belonging to his political party and chanting his nickname, "Ibu, Ibu, Ibu," according to the BBC. Speaking to reporters in the capital, Solih called it "a moment of hope" after a difficult journey "that has led to a prison cell or years in exile." President Abdulla Yameen Abdul Gayoom conceded defeat Monday on state television, amid fears that he would not accept the unexpected election results. He promised a smooth transition. Yameen, who was elected in 2013, has been accused of jailing rivals and curtailing democratic freedoms. In February, he triggered condemnation in the West by declaring a state of emergency. His government arrested two Supreme Court judges and opposition leader Maumoon Abdul Gayoom, his half-brother who also served as president from 1978 to 2008. The night before polls opened, police raided Solih's campaign headquarters. There was talk of rigging, and no observers from the European Union and the United Nations were sent to monitor the election, NPR's Lauren Frayer reported. India was among one of the first countries to congratulate Solih. The foreign ministry called his victory a "triumph of democratic forces." Prime Minister Narendra Modi phoned Solih and "conveyed his good wishes for strengthening of democracy," according to India's Ministry of External Affairs. The electoral outcome is seen as a potential setback for China on the archipelago, which lies at the center of a rivalry between India and China. Under President Yameen, China saw increasing opportunities to invest in the Maldives. Major Chinese developments included an extension to the international airport and a bridge that connected it to the capital, according to Reuters. But Solih, during the election, vowed to review those deals. Opposition accused Yameen of pushing the Maldives into debt which left the tourist destination open to influence from Beijing. The Maldives vote is not the only rebuke of China. "The results of Sunday's elections echo recent events in Malaysia, where voters tossed out a government that had steered the country into China's orbit with high-profile and often controversial deals," The Wall Street Journal reported. 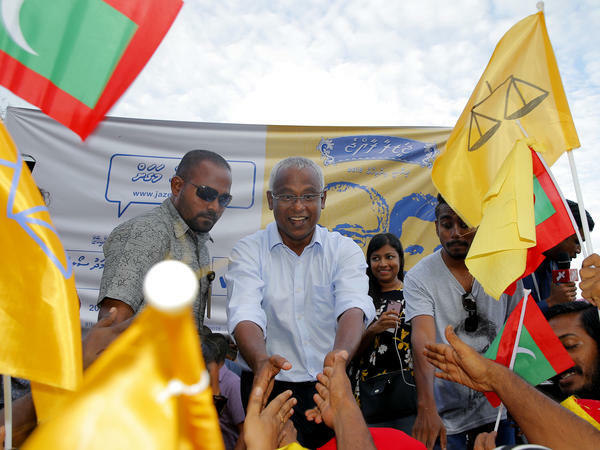 Mohamed Nasheed, Maldives' first democratically elected president, praised Solih, who belongs to his political party. "You have done an extremely good service to not only to the people of Maldives, but also to freedom loving people everywhere," the exiled leader said in a tweet. "Democracy is a historical inevitability." Solih studied in Australia, before working in state and opposition media and being elected to Parliament at age 32, according to the Associated Press. He also helped write a new constitution for the country. The Maldives transitioned to democracy in 2008, following three decades of authoritarian rule. In recent years, it has seen political turmoil. Solih will reportedly be sworn in on Nov. 17, beginning a five-year term.